Bì chay is probably one of my favorite Vietnamese vegetarian street foods. Not only is it a popular everyday eat, but it is also very common at temples. 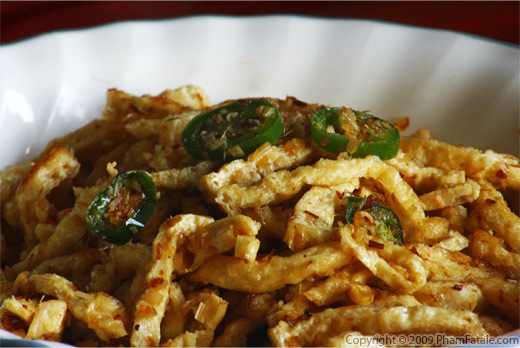 It's a mix of fried Asian ingredients such as tofu, taro, potatoes, jicama and fine vermicelli noodles. The whole mix is topped with dry toasted jasmine rice mill. It gives a nice aroma and chewy texture to the blend. Whenever I pack sandwiches for a picnic, I either make the good ol' cheese and vegetable sandwich or an Asian-style sandwich, which is called bánh mì chay. It is a Vietnamese-style baguette sandwich stuffed with bì chay, pickled daikon and carrots, and green sliced chiles. You can also simply eat bì chay with bún (bún chay), the vegetarian equivalent of bún cá chiên (fried fish with vermicelli rice noodles). 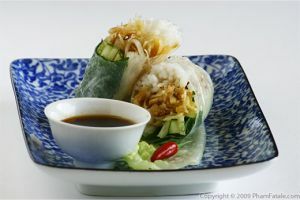 If you want to serve this as a appetizer (bì cuốn chay) for a vegetarian crowd, just wrap the bì chay in rice paper and create little spring rolls. For the tofu: Drain any liquid from the tofu. Pat dry with a paper towel. Slice the tofu into 1/2-inch thick pieces. In a large pan, heat about 2 tablespoons of oil; fry the tofu slices and transfer to a plate. Once the tofu is cool enough to handle, cut the pieces into very thin strips. Set aside. For the dried bean thread noodles: Place the whole package of dried bean thread noodles in a bowl. Don't forget to cut the little threads and discard them! Soak the noodles in cold water for 30-40 minutes (up to 1 hour, depending on the bean thread noodle brand), then drain. Chop into 1 inch threads. Set aside. For the jicama: Peel and slice horizontally into 1/2-inch thick pieces. In the same large pan, add about 1 tablespoon of oil and fry all the jicama slices until golden brown. Once they are cool enough to handle, cut the pieces into very thin strips. Set aside. For the taro and potatoes: Peel and shred the taro. Place in a large bowl. Fill the bowl with water and 2 tablespoons of lemon juice. Let sit for about 15 minutes, then drain all the liquid. Pat dry. Repeat the same procedure with the potatoes. In the same large pan, add about 2 more tablespoons of oil. Sprinkle about 4-5 tablespoons of taro evenly into the pan. Do not stir. Wait for at least 2 minutes until one side is nicely fried, crisp and golden. Flip the taro using chopsticks. Continue until all the taro is fried and repeat the same procedure with the potatoes. Add more oil if necessary. Assembly time: In the same large bowl with the fried taro and potatoes, add the jicama, tofu, vermicelli and fried onions. Season with mushroom powder, salt and pepper. Toss well, then sprinkle with dry roasted rice powder. Place on a serving platter. On one plate, place thick rice vermicelli noodles (called bún). On another plate, add fresh vegetables like lettuce, cucumber, bean sprouts, fresh coriander and Vietnamese mint, and pickled vegetables like carrots, baby shallots and daikon. Fill a bowl with nước tương (vegetarian dipping sauce) and another with crushed, salted peanuts. It's family style - everyone helps themselves to their own bowl, starting with the veggies, the noodles, and then finally the bì chay. Pour on the nước tương sauce, add the coriander and mint and sprinkle some peanuts to garnish. Lastly add sliced red bird chili if you like it spicy. To be eaten with chopsticks of course! Dry roasted rice powder is called thinh in Vietnamese. If you want a finer mill for the roasted rice powder, you can use the Nutrimill brand mill if you have one. I got one several months ago, and it's very useful for making any kind of flour. It's a great complement for gluten allergies as well. I make my own flour with buckwheat, oat, sorghum and spelt. You can also buy ready-made thinh in Asian stores, but I prefer grinding my own for a more fragrant toasty scent. You can use it for bì (shredded meat with thinh) or grilled lemongrass beef with thinh and served with cơm tấm (jasmine broken rice). You can also toss the rice powder in salad; it absorbs all the moisture and helps keep the salad dry. Taro root is a firm, hairy vegetable as starchy as a potato and used very often in Asian cuisine. I absolutely love the Thanh Son tofu brand. If you live in the Bay Area, you have to try it. They sell it in almost all the Asian markets in downtown San Jose and their main shop is on 2857 Senter Road, San Jose. It's a very little shop but everything is very good. Their factory makes the best tofu texture. They make fresh tofu daily. Jicama is a large, sweet, firm turnip that is used in vegetarian Vietnamese cuisine to imitate the juicy pork fat and pork skin (when fried). It's crunchy like an apple and filling like a potato. You can find it in any Vietnamese store; it's called củ sắn. Frying onions is easy. Chop the onion. Heat about 1 inch of canola oil in a skillet. Fry the onion in the oil, stirring frequently to prevent them from burning until the color is evenly golden brown. Drain the oil on paper towels. I always make extra so that I can vacuum-seal and store them in the freezer for future use. I place about one cup per bag. You can store them up to 3 months. I think it's the best way to keep the same flavor without getting freezer burn. I keep them exactly the same way I would with extra pesto or the (papaya) meat tenderizer for poultry. You can add black fungus mushrooms that you re-hydrated to the bì chay mixture. I don't because my father-in-law is allergic to mushrooms. 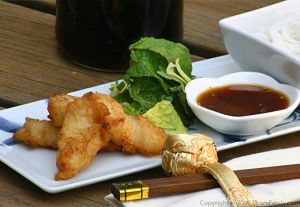 Serve the bì chay with a soy sauce dipping sauce; I'll post the recipe tomorrow. You can find the fish sauce version, here. Published By: Jacqueline Pham on July 27, 2009. Bi Chay is one of my faves as well. Your version looks delightful. Thanks so much for sharing this recipe. What a unique way to serve tofu. 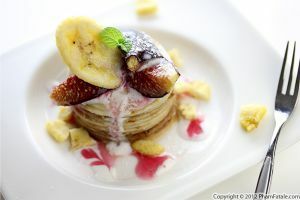 I love all the ingredients and the look of the dish is fantastic. Super idea and one I am going to try for sure. I have never heard of this, but it looks great! Looks very good and like it takes a bit of time to make! Looks so good! I bet that dipping sauce was delicious too! This is another one that looks just marvelous. This is a whole new way of thinking about cooking for me. Thanks for the very detailed recipe. I am amazed when I eat at certain vegetarian friendly Asian restaurants and they have all kinds of fake meats and dishes that I've never heard of. If there is one type of cuisine I need help with it is this. I am very thankful for this recipe, can't wait to try it. 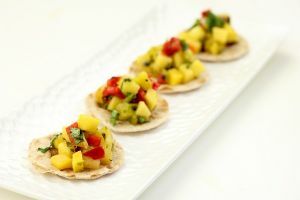 Excited to learn a new preparation of tofu - looks delicious, I would love to try it! 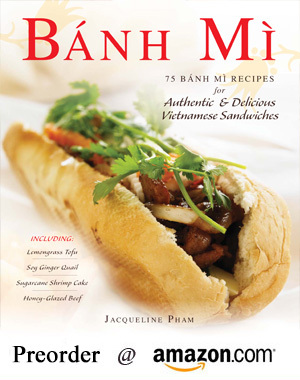 Oh this is the first time I've seen this, and I am so intrigued...this WOULD be lovely as a bahn mi! First, I would like to thank you for stopping on my blog and taking the time for commenting. It seems that you have access to a lot of really exotic ingredients where you live! This is so great! My dream: be able to travel enough and cook in different countries! The ingredients change so much a recipe! This looks fantastic. I've never had this before. Every time I come to your blog, it reminds me how many new flavour combinations I have to try!! When you said spring rolls, we were right alongside you. Isn't street food some of the best? I like your recipes very much, I am also a vegetarian so my family. I always search for vege-recipes online. Hope one day we can share our recipes together. I'm a newly converted vegetarian for health reasons and thought I would have to give up on my favorite traditional foods. My daughter is a somewhat picky eater, but your recipes look and sound amazing. Thank you so much for sharing your talent with the rest of us. Boom beach game is played by nearly million people across the globe. It was rated as best game in year 2014. Don't miss playing this awesome game. You can visit this site to know more.